Documenting a bit of process, and hopefully progress. Much harder than posting about teaching artistry, and the work of my wondrous students.. I will try my hand at it, and hopefully find my way, a way. Time, as usual, is an issue. Focused meditative time, is needed, and after home and studio, there just isn’t much to spare. But, nothing ventured, nothing gained. 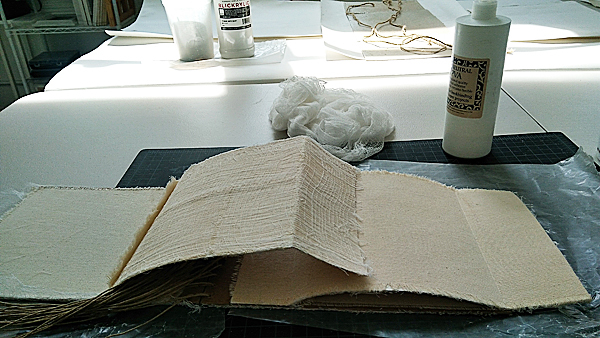 Pushing into new materials….layering on gossamer cheesecloth onto a structure, because of its weave of threads, needed to coat the whole surface with acid-free PVA/glue, and place the cheesecloth on it, cut around it and trim the excess when surface dried…surprisingly quickly, with the sun and a light breeze coming in through the window. The light-filled space at 18th Street is perfect for this work, this effort, these discoveries, this journey. Multiple surfaces, the nature of many book structures comprised of covers, spine and pages compels working one surface at a time, letting it dry and then moving to the next one. 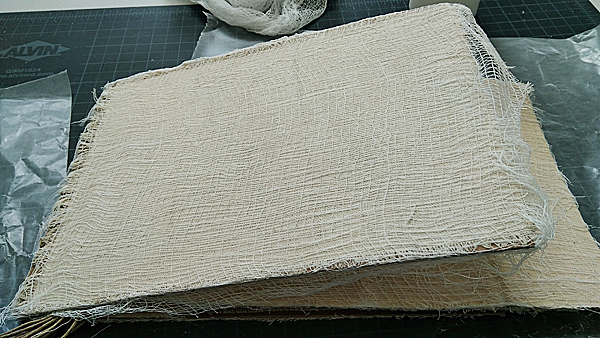 Cheesecloth layered over raw canvas, layered over book board. 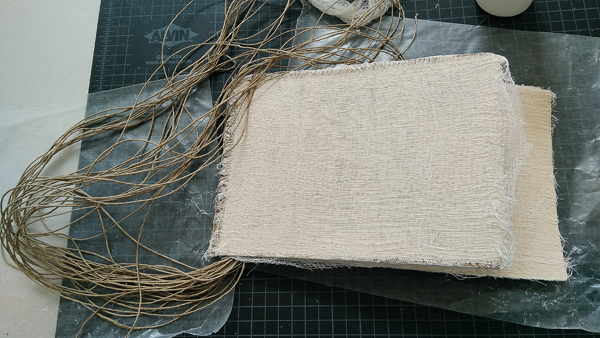 The cheesecloth is unruly stuff…more like threads kept in place loosely, by the cross weave. The two pieces of board, AKA, covers, are hinged together with long strands of jute cord, raw jute, so raw it has a fragrance. Strand are threaded through corresponding holes made with the awl in both covers, which move by sliding left and right over the cords. Simple, yet amazingly effective. The juxtaposition of the materials in layering, adjacency and flow, as regard to interlocking color, differentiated textures and various states of unravel, fascinates me….how does the light get in and travel through, or not, how does the dimensionality affect how we see and respond to the work, sensorily, emotionally, viscerally, how do the materials work together in some kind of harmony, yet buttress up against each other with force at the same time? Need to push on, need to keep exploring, finding more questions with just the tiniest intimation of any answer in them. Think I will keep on going.